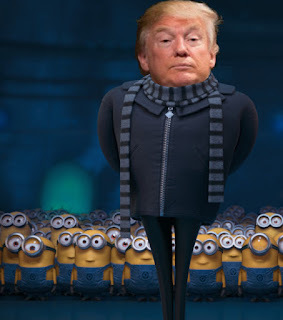 I think it's apparent to most sane Americans that after two years of Trump, he's the real world Gru character from the Despicable Me movie franchise. With one caveat, unlike the cartoon character, Trump doesn't end up being a good guy. Nothing touches his heart (if he has one), unlike the movie's supervillain. As Trump becomes increasingly rabid about immigration he's ready to do anything - regardless of the human consequences. Combining his racist attitude and his hatred for Democrats, Trump has come up with a supposed "fix" that even ICE officials thought - at first - was a joke, despite being a grim one. After several attempts ICE realized the idiot-in-chief was serious and declined to follow up with his desperate requests/orders. The fact that Trump wanted to divert immigrants to so-called Democratic sanctuary cities as a way to retaliate against his opposition, didn't go down well with immigration authorities. Ashley Etienne, a spokeswoman for Nancy Pelosi, labeled Trump's partisan attempt as "despicable." "Using human beings - including little children - as pawns in his warped game to perpetuate fear and demonize immigrants is despicable, and in some cases, criminal," Etienne told reporters. Up until two days ago, the WH press claimed Trump's idea was just floated around in conversation and was rejected. That story was suddenly scuttled on Friday. On Friday morning our grifter-in-chief undercut his own administration officials and announced he is considering moving immigrants to sanctuary cities to retaliate against Democrats. It looks like Trump/Gru is going to be pitted against the courts (and laws) once again, despite being slapped down by those courts numerous times. Using people as pawns is only one of the many despicable things Trump has done while in office.